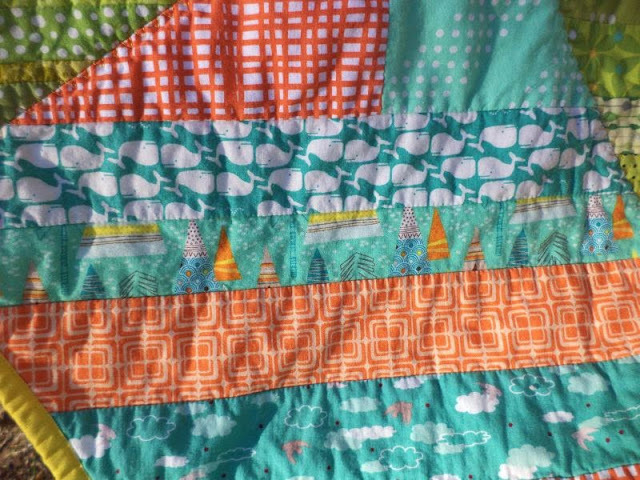 Welcome once again to the Bloggers' Quilt Festival, hosted at Amy's Creative Side. 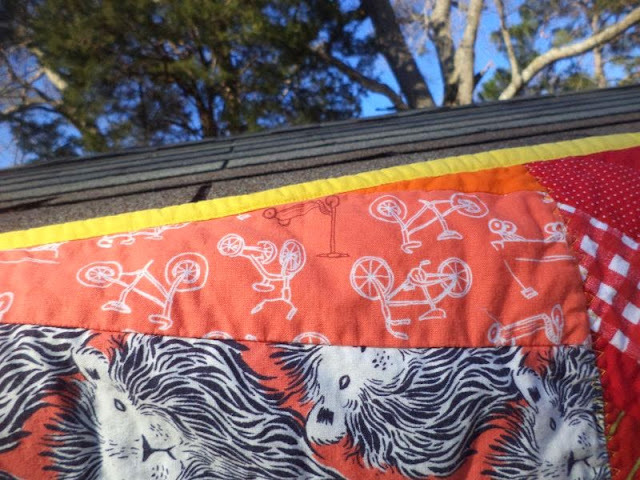 Every time I participate in the festival it seems I end up including at least one quilt made by my do. Good Stitches group the NURTURE circle. This quilt was our January project; I am entering it in the ROYGBIV category. Each member of the circle made 2 foundation pieced, QAYG string blocks and mailed them in. If you are interested a tutorial for the block can be found here. The finished quilt and matching pillowcase were mailed to My Very Own Blanket. Since the blocks were QAYG all I had to do was join them and then stitch on a backing. 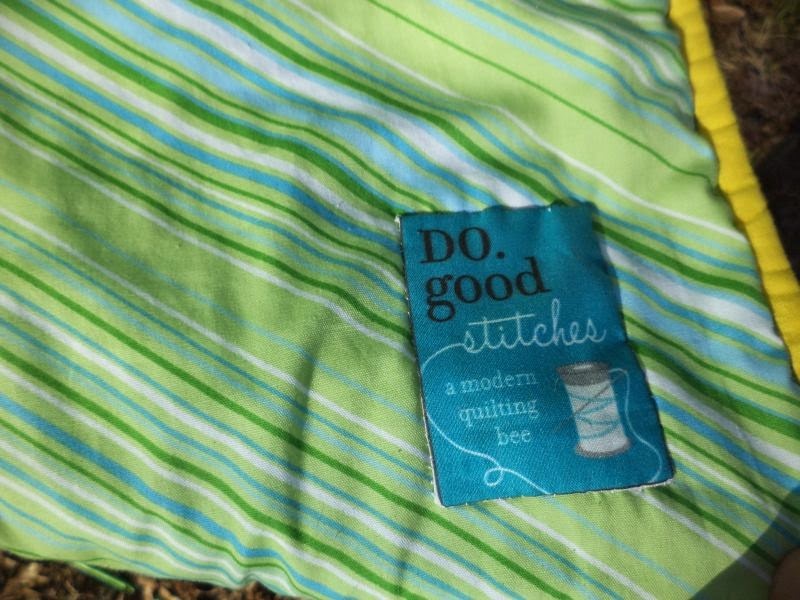 To reduce the bulky seams I pressed them open and use a triple zig zag to stitch over them. 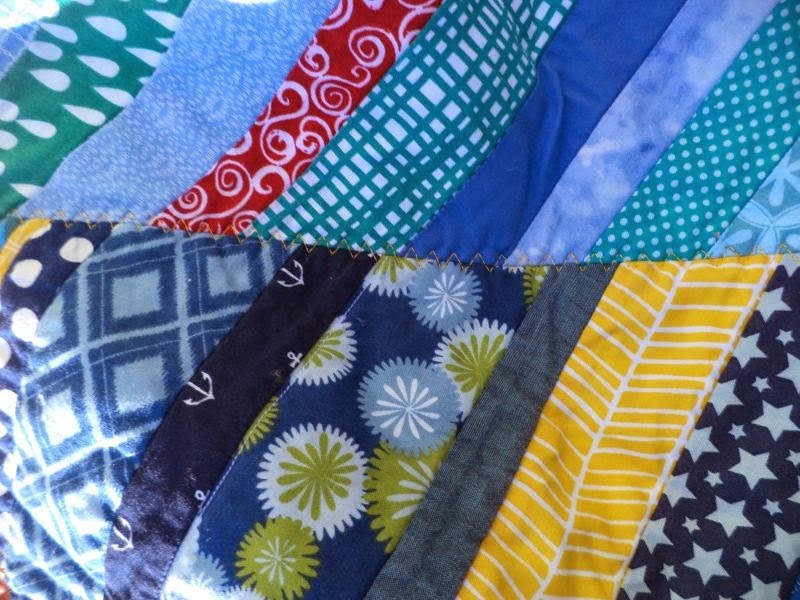 The ladies in my circle did such a great job of choosing fun novelty fabrics for their blocks! 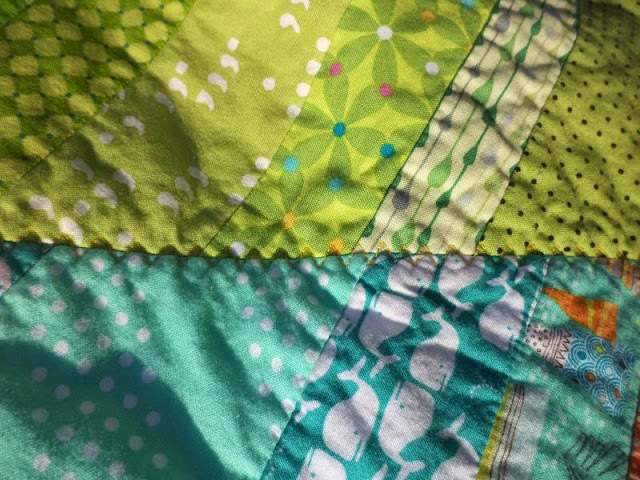 I like how the quilt has an overall ROYGBIV gradient but the odd pops of contrasting color jump out at you. Because the blocks were foundation pieced onto their battings only the zig zag quilting at the block edges shows on the back. Some fun lions and bikes and a bright yellow binding. This was actually one of the last quilts we sent to MVOB. Starting with this month's quilt the group has voted to begin donating our quilts to my pet charity, Covered in Love, which donates quilts to the families of patients who pass away in the hospital where I work. Don't forget to check out the rest of the festival and visit my other entry in the scrappy quilts category here. What a great quilt! 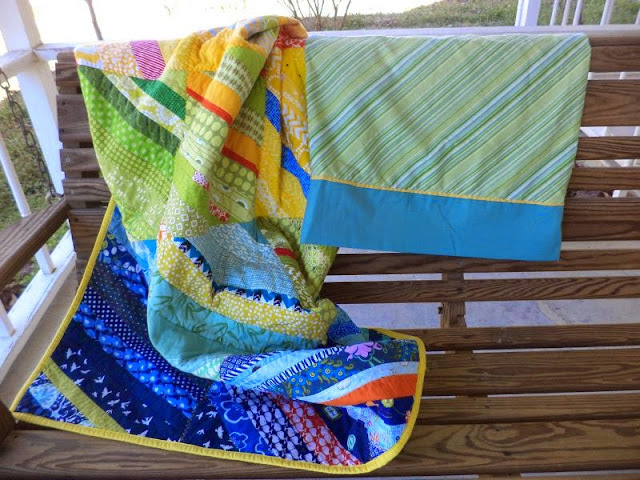 I think these blocks are so cool, and how nice of your group to make such a wonderful quilt for someone in need. Lovely quilt Kat! 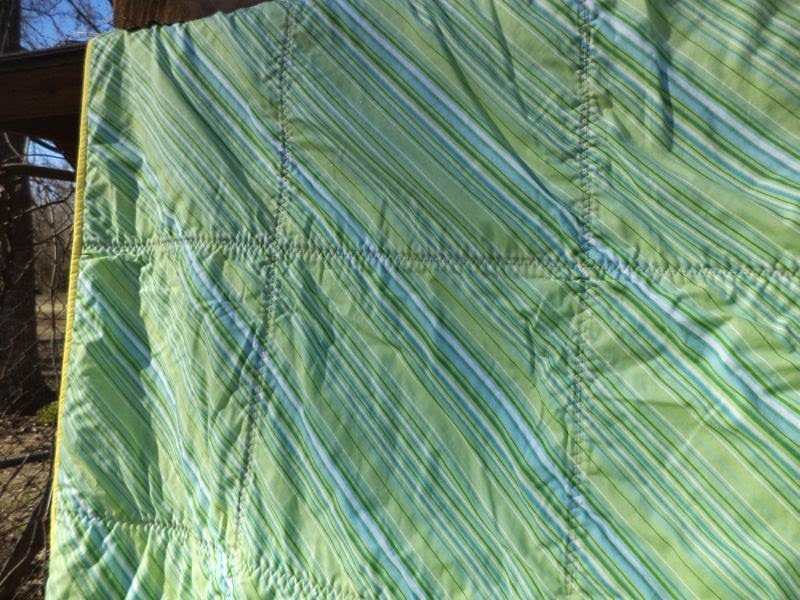 I'm sure the new owner will feel plenty of warmth and love from this quilt. Beautiful quilt, Kat! So glad that future quilts will by going to Covered in Love! it's a fabulous quilt, usually strings are too busy for me, but the colour scheme makes them seem harmonious. Love the yellow binding! What a fun quilt. I really like how you linked the blocks together. 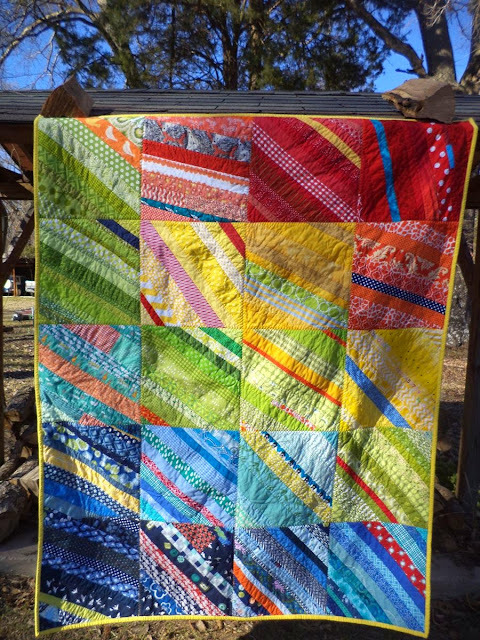 This is a cute idea for a rainbow quilt. Good job.